'STAR WARS: THE RISE OF SKYWALKER' DEBUTS NEW TRAILER AT STAR WARS CELEBRATION! Today, Director/Writer J.J. Abrams and Producer Kathleen Kennedy were joined by stars Daisy Ridley, John Boyega, Kelly Marie Tran, Oscar Isaac, Billy Dee Williams, Naomi Ackie, Joonas Suotamo and Anthony Daniels, and droids BB-8 and D-0, for a panel discussion at Star Wars Celebration in Chicago, moderated by Stephen Colbert. It was a day of surprises at Star Wars Celebration for the enthusiastic fans in attendance as the title of the final installment of the Skywalker saga was also revealed, Star Wars: The Rise of Skywalker, and along with the first trailer for the film a brand-new teaser poster! Check out these new social handles, too! Star Wars: The Rise of Skywalker opens in U.S. theaters on December 20. THE KING ARRIVES IN 100 DAYS - Watch the brand new trailer now! The brand-new trailer for Disney’s “The Lion King” is available now, marking 100 days until Simba arrives in theaters on July 19. Disney’s “The Lion King, directed by Jon Favreau (“The Jungle Book”), journeys to the African savanna where a future king is born. Simba idolizes his father, King Mufasa, and takes to heart his own royal destiny. But not everyone in the kingdom celebrates the new cub’s arrival. Scar, Mufasa’s brother—and former heir to the throne—has plans of his own. The battle for Pride Rock is ravaged with betrayal, tragedy and drama, ultimately resulting in Simba’s exile. With help from a curious pair of newfound friends, Simba will have to figure out how to grow up and take back what is rightfully his. Staying true to the classic story, director Jon Favreau utilizes pioneering filmmaking techniques to bring the iconic characters to the big screen in a whole new way. Featuring the voices of Donald Glover as Simba, Beyoncé Knowles-Carter as Nala, James Earl Jones as Mufasa, Chiwetel Ejiofor as Scar, Seth Rogen as Pumbaa and Billy Eichner as Timon, Disney’s “The Lion King” opens in U.S. theaters on July 19, 2019. MISSING LINK starring Hugh Jackman, Zach Galifianakis, Zoe Saldana and More! This April, meet Mr. Link (Galifianakis): 8 feet tall, 630 lbs, and covered in fur, but don’t let his appearance fool you… he is funny, sweet, and adorably literal, making him the world’s most lovable legend at the heart of Missing Link, the globe-trotting family adventure from LAIKA. Tired of living a solitary life in the Pacific Northwest, Mr. Link recruits fearless explorer Sir Lionel Frost (Jackman) to guide him on a journey to find his long-lost relatives in the fabled valley of Shangri-La. Along with adventurer Adelina Fortnight (Saldana), our fearless trio of explorers encounter more than their fair share of peril as they travel to the far reaches of the world to help their new friend. Through it all, the three learn that sometimes you can find a family in the places you least expect. Producers: Travis Knight p.g.a., Arianne Sutner p.g.a. We’re in the endgame now. Watch this brand-new featurette from Marvel Studios’ AVENGERS: ENDGAME! Marvel Studios’ AVENGERS: ENDGAME releases in U.S. theaters on April 26. The toys hit the road in “Toy Story 4” alongside friends—new and old—foes and, of course, Forky. Filmmakers welcomed Christina Hendricks, Keanu Reeves and Ally Maki to the toy box today, revealing the three new characters they help bring to life. Check out the new trailer! Among the new faces is GABBY GABBY, an adorable, talking pull-string doll from the 1950s. But unfortunately for her, a manufacturing defect in her pull-string voice box has left her sounding anything but adorable. She has spent more than 60 years forgotten in the depths of a jam-packed antique store—her only companions are a band of voiceless ventriloquist dummies. Gabby Gabby knows someone will want her if only she can find a working voice box to repair hers. DUKE CABOOM is a 1970s toy based on Canada’s greatest stuntman. Riding his powerful Caboom stunt-cycle, Duke is always prepared to show off his stunt poses with confidence and swagger. However, Woody learns quickly that Duke has an Achilles heel: He has never been able to do the awesome stunts advertised in his own toy commercial. For years, Duke has been sitting in an antique store, constantly reliving the failures of his tragic past. Duke Caboom is voiced by another great Canadian, Keanu Reeves. “The first time Josh [Cooley] and I talked with Keanu about the role, Keanu became Duke Caboom,” says producer Jonas Rivera. “Keanu was asking great questions that dug deep to find the soul of the character. At one point he stood up on the table in the middle of Pixar’s atrium and struck poses while proclaiming victory. It was so funny. It’s all in the movie and it’s all Keanu." Ally Maki voices the tiny character. “Giggle McDimples literally pops on the screen because of Ally’s personality and infectious energy,” says Cooley. “Nobody can laugh like Ally Maki." BENSON is a classic, antique ventriloquist dummy, and Gabby Gabby’s right hand. He leads a small group of ventriloquist dummies that serve as Gabby's henchmen. With no person to give them a voice, these silent toys patrol the antique store with a looming quietness that is inherently unsettling. Directed by Josh Cooley (“Riley’s First Date?”), and produced by Jonas Rivera (“Inside Out,” “Up”) and Mark Nielsen (associate producer “Inside Out”), Disney·Pixar’s “Toy Story 4” ventures to U.S. theaters on June 21, 2019. “Toy Story 2” is the first film ever to be entirely created, mastered and exhibited digitally. It was also the first animated sequel to gross more than its original, breaking opening weekend box office records in the U.S., UK and Japan, becoming the highest grossing animated release of 1999. It won the Golden Globe for best motion picture – comedy or musical. It won a Grammy® for best song written for a motion picture, television or other visual media (Randy Newman, “When She Loved Me”). The 2015 short “Riley’s First Date?” was helmed by director Josh Cooley and produced by Mark Nielsen. A SPECIAL LOOK AT “CAPTAIN MARVEL” AVAILABLE NOW & TICKETS ON SALE! Watch the exclusive look at Marvel Studios’ CAPTAIN MARVEL that aired last night on ESPN during the 2019 College Football Playoff National Championship game between the Clemson Tigers and the Alabama Crimson Tide. Feel free to share it with your readers! Tickets to CAPTAIN MARVEL are on sale now everywhere tickets are sold. Marvel Studios’ CAPTAIN MARVEL opens in U.S. theaters on March 8, 2019. LOS ANGELES, CA -- From Academy Award® Winner Steve McQueen*, the director of 12 Years a Slave, and from Gillian Flynn, the writer of Gone Girl, comes a powerful thriller with a stellar cast, including Oscar® Winner Viola Davis**, Michelle Rodriguez, Elizabeth Debicki and Cynthia Erivo. Four women — with nothing in common except a debt left by their dead husbands’ crim`inal acts — conspire to take fate into their own hands. Also featuring Colin Farrell, Robert Duvall and Liam Neeson, Widows delivers explosive action and gripping suspense! The Blu-ray is packed with nearly 60-minutes of bonus content, with three documentary featurettes filled with in-depth interviews and raw on-set footage detailing the compelling production story of WIDOWS. Certified Fresh™ on Rotten Tomatoes®, Widows arrives on 4K Ultra HD™, Blu-ray™ and DVD on February 5. Twentieth Century Fox Home Entertainment, LLC (TCFHE) is a recognized global industry leader and a subsidiary of Twentieth Century Fox Film. TCFHE is the worldwide marketing, sales and distribution company for all Fox film and television programming, acquisitions and original productions as well as all third-party distribution partners on DVD, Blu-ray™, 4K Ultra HD™, Digital and VOD (video-on-demand). Each year TCFHE introduces hundreds of new and newly enhanced products, which it services to retail outlets and digital stores throughout the world. SURVIVE. IN 10 DAYS THE JOURNEY BEGINS. | New BIRD BOX Trailer! Check out the all-new trailer for NETLFIX’S upcoming thriller BIRD BOX - featuring Academy Award® winner Sandra Bullockand an all-star cast including Trevante Rhodes, Sarah Paulson, John Malkovich, Lil Rel Howery and more; premiering December 21. Bird Box will have exclusive limited theatrical engagements in Los Angeles, New York, San Francisco, and London starting December 13. The film will be released globally on Netflix on December 21 and will have an expanded theatrical release in additional theaters in the U.S., and throughout Europe. Produced by | Dylan Clark, p.g.a., Chris Morgan, p.g.a., Clayton Townsend, p.g.a. Synopsis: When a mysterious force decimates the world’s population, only one thing is certain: if you see it, you take your life. Facing the unknown, Malorie finds love, hope and a new beginning only for it to unravel. Now she must flee with her two children down a treacherous river to the one place left that may offer sanctuary. But to survive, they'll have to undertake the perilous two-day journey blindfolded. Academy Award® winner Sandra Bullock leads an all-star cast that includes Trevante Rhodes, with Sarah Paulson, and John Malkovich in BIRD BOX, a compelling new thriller from Academy Award® winner Susanne Bier. 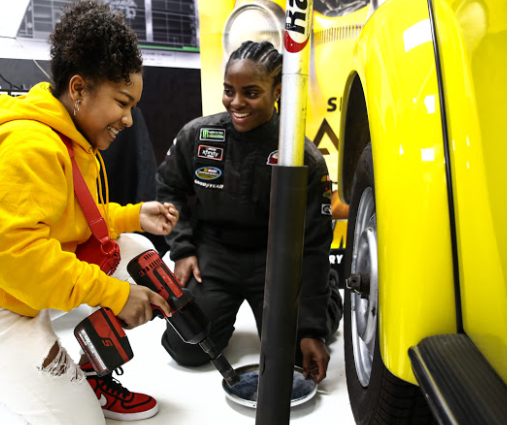 With the upcoming release of BUMBLEBEE (Releasing December 21, 2018) local female influencers gathered at West Coast Customs (Pimp My Ride) for a special Glammed Out Auto Clinic taught by Tia Norfleet, the first African American Female NASCAR Racing Star and Brehanna Daniels, the first female African-American pit crew member. The two historical figures spoke to the ladies in attendance about overcoming adversity, having strong support systems and everything NASCAR. The ladies later learned how to check their oil and change a tire while in their heels! Emmet’s Holiday Party: A LEGO Movie Short! The LEGO Movie will hit theaters on February 8, 2019! Check out the new trailer for Avengers: Endgame in theaters April 26, 2019!! Check out the new trailer for AVENGERS:ENDGAME!! Chadwick Bozeman, Scarlett Johansson, Chris Evans, Chris Hemsworth, and Robert Downey Jr. are among the members of the cast of the fourth installment of the Avengers series. The plot of the star-studded Marvel film has yet to be revealed. SHAZAM! will be in theaters April 5, 2019. ALITA: BATTLE ANGEL | New Trailer | In theaters Feb 14, 2019! From visionary filmmakers James Cameron (AVATAR) and Robert Rodriguez (SIN CITY), comes ALITA: BATTLE ANGEL, an epic adventure of hope and empowerment. When Alita (Rosa Salazar) awakens with no memory of who she is in a future world she does not recognize, she is taken in by Ido (Christoph Waltz), a compassionate doctor who realizes that somewhere in this abandoned cyborg shell is the heart and soul of a young woman with an extraordinary past. As Alita learns to navigate her new life and the treacherous streets of Iron City, Ido tries to shield her from her mysterious history while her street-smart new friend Hugo (Keean Johnson) offers instead to help trigger her memories. But it is only when the deadly and corrupt forces that run the city come after Alita that she discovers a clue to her past – she has unique fighting abilities that those in power will stop at nothing to control. If she can stay out of their grasp, she could be the key to saving her friends, her family and the world she’s grown to love. About a Hasidic cantor’s struggles to find religious solace after his wife’s untimely death, while secretly obsessing over how her body will decay. Shawn Snyder’s TO DUST premiered at this year’s Tribeca Film Festival, followed by screenings at the San Francisco Jewish Film Festival and the Hamptons International Film Festival. This feature film debut from Snyder is tells the tale of Shmuel, a Hasidic cantor in Upstate New York, who is distraught by the untimely death of his wife, Rivkah. As he struggles to find solace in his religion, which proffers a stringent timeline for grief, Shmuel grows increasingly haunted by visions of Rivkah’s decomposing corpse. Convinced that her soul will suffer until her body returns to dust, Shmuel decides that to stop his feverish spiral he must seek an understanding of the physical processes of her decay - despite the blasphemy inherent in any scientific inquiry. Risking discovery and expulsion, Shmuel tip-toes outside his enclave, where his search leads to Albert, a bumbling biology professor at the local community college. Soon, Albert is unwittingly seduced into an odd world of homespun forensic research and begins to guide Shmuel through outrageous experiments that aim to approximate a timeline for Rivkah’s dissolution - starting with the theft, suffocation and burial of a pig. As amateur scientists practicing imperfect science and incompetent criminals on progressively absurd outings, the two find themselves neck-deep in genres in which neither of them belongs. With their macabre moonlit misadventures growing ever more perilous, the odd couple will stop at nothing to satiate their curiosity and ultimately find Shmuel the comfort he desperately seeks. 92min. Shawn Snyder grew up in South Florida. After receiving a BA in Religion from Harvard, he spent most of his twenties on the road as a singer/songwriter. The last seven years have seen a return to Shawn's long-standing passion for filmmaking, during which he completed studies at NYU's Graduate Film Program. His short film, FESTUS, won the 2014 CINE Golden Eagle Award for Best Student Drama and later premiered on KQED’s Film School Shorts. His follow-up, LULU, premiered at the Palm Springs International ShortFest in 2015. And his first feature, TO DUST, premiered at the 2018 Tribeca Film Festival, where it won the “Narrative Audience Award” and Shawn received the award for “Best New Narrative Director.” TO DUST was a part of IFP's 2015 Emerging Storytellers, the recipient of the NYU/Alfred P. Sloan’s $100K First Feature Award, the winner of TFI's 2016 Sloan Student Grand Jury Prize, and a part of the NYU Production Lab's inaugural slate. Shawn is also a former IFP/Marcie Bloom Fellow and Sundance Institute Feature Film Fellow, and was named one of Filmmaker Magazine's "25 New Faces of Independent Film” in 2016. WONDER PARK - Official Trailer Available Now! Follow us on social media for more updates! · “Toy Story,” originally released on Nov. 22, 1995, was the first fully computer animated feature film and the highest grossing movie of the year. It was nominated for three Oscars® and two Golden Globes®. · “Toy Story 2” is the first film ever to be entirely created, mastered and exhibited digitally. It was also the first animated sequel to gross more than its original, breaking opening weekend box office records in the U.S., UK and Japan, becoming the highest grossing animated release of 1999. It won the Golden Globe for best motion picture – comedy or musical. It won a Grammy® for best song written for a motion picture, television or other visual media (Randy Newman, “When She Loved Me”). · The 2015 short “Riley’s First Date?” was helmed by director Josh Cooley and produced by Mark Nielsen. BUMBLEBEE | New Poster Available Now! Click the Icons below to follow BUMBLEBEE on social! Werewolf Ninja Philosopher, an art verité, film noir, independent comedy film by Sujewa Ekanayake opens at the Maysles Cinema tonight at 7 pm. The film runs for a week, Oct 25-31, until Halloween, playing at 7 pm every night. There will be post screening Q&A with the cast and filmmaker, an opportunity to meet them in-person, followed by costume parties and special prizes for the best dressed and biggest fans. This is your chance to celebrate your Halloween week with the Werewolf and the team. Tickets on sale now! Checkout the link below for more details and tickets. Werewolf Ninja Philosopher, an art verité independent comedy film by Sujewa Ekanayake opens at the Maysles Cinema tonight at 7 pm. The film runs for a week, Oct 25-31, until Halloween, playing at 7 pm every night. There will be post screening Q&A with the cast and filmmaker, an opportunity to meet them in-person, followed by costume parties and special prizes for the best dressed and biggest fans. This is your chance to celebrate your Halloween week with the Werewolf and the team. Tickets on sale now! THE HOLIDAY CALENDAR will launch globally on Netflix November 2.